The Online Photographer: The World's One and Only?!? The World's One and Only?!? 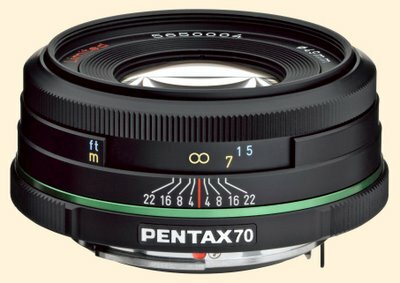 The new lens is a 70mm ƒ/2.4 and, like the previous DA's before it (the 40mm and the 21mm), is a pancake. Well, Mike, this may sound strange--but the fact that Pentax has provided these three lenses and what looks like it may be a real "large glass pentaprism with 95% coverage" may actually pry me away from Canon EOS after 15 years. I think these Pentax folks have really put some thought into how to differentiate themselves from the pack with a few very nice touches that will appeal more to photographers than pixel peepers. Here's hoping the noise level is well controlled at ISO 400 and 800. I am very, very tempted by this. Those three primes (and perhaps the Sigma 30/1.4 just because I love that lens) and that body seems like a dream come true. If real reviews don't have any nasty surprises regarding high-ISO noise, my Canon is going on the block this winter. I agree and when you go through the K10D details or hold a K100D, you can't help to remember that phrase you used, John: "I love the way those people think". It is the same when I use my 645Nii, pure joy, they *must* have photographers involded at design stage, not just for the final tests. Pentax is really gaining momentum - as far as I can tell, indeed with - already said earlier - touches and details on their camera's that will draw a specific crowd away from the innovation-deprived 'eyes-closed' successors of CaNikon. Who undoubtly on diverso photofora will continue to say: not enough lenses, not enough support, small brand, blablabla. Whereas Minolta was the underdog before, I think Pentax might be the 'new Minolta' - innovation where it counts. Now lets wait for the quality reviews. Hi Mike what about Alpha with 20mm f2.8 - 28mm f2.8 - 35mm f1.4 and 50mm f1.4. "But when it comes to the best autofocus lenses in the world, whether for a viewfinder camera or SLRs, it's still Zeiss and Pentax, baby, same as the old days." You're prescient; any stock recommendations? Greetings from Brazil! It's so cool to have found your blog, after reading some of your texts at Luminous Landscape! Wow is all I could say. I'm definitely a prime shooter in the wide to short tele range, and Pentax is the only manufacturer I see offering this for an APS-C camera. If they bring out a small sized SLR like the panasonic/leica digilux 3, I'm sold. I had a pancake to my Pentax ME. That was very small for a SLR and it was great fun and often used. The shortcomings - so what! Uh, Pentax already has released a number of digital bodies that are the size of 70s era SLRs. The current K100D is 130mm x 92.5mm x 70mm. The Pentax MX was 136mm x 83mm x 49mm. The handgrip accounts for the difference between 70mm and 49mm in the one dimension. The previous *ist series was of similar size. I'd say the lenses you get are the DA 14mm, 21mm, and 70mm. That's an equivalent of 21mm, 31mm, and 105mm. The 40mm would be so much better as a 35mm. I prefer a "wider" normal, not the "tighter" normal that the 60mm-equivalent provides. I've got my K100D, I'm now saving for the lenses. The DA 21 is the lens I've been wishing that Olympus would make. As "obsolete" as my E-1 is, there is still a lot to like about the camera. I'm very tempted to get a K10D and the 21. This seems like an awesome "carry anywhere and all the time" combo. Here, those can't be no proper lenses, they got no apature ring! Seriously, what have these companies got against apature rings....I feel like grabing the designers, showing them one of their great lenses from the past and saying "make it look like this so us poor dumb dinosaurs can operate it" If they are charging four or five c-notes for these things, then they can doggone make them work like real lenses. I know I sound like a grump, but if they can sell a complex multi-element zoom lens for $100, then why do these have to be five times the price? Very interesting set of lenses indeed. But, is there any environmental-sealed lens in the Pentax portfolio? You get a fully sealed body, and there is no competitor for that within four times the price. But what for, if the rain can leak from the lens? Am I missing something? If I buy the new Pentax, Mike, it's all your fault. "If I buy the new Pentax, Mike, it's all your fault." I came close to moving to Canon a few years back. I'm now very happy that I didn't. The K10D is everything I want in a DSLR, and the new glass is superb. I used the DA 12-24/4 for a magazine shoot of a home interior, and the results were great. I'm looking forward to more primes from Pentax with ring-motor autofocus.